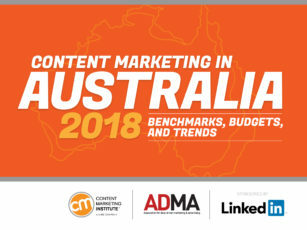 Like their peers in North America, Australian content marketers say their organizations are concentrating more on building audiences than they were a year ago. As reported in Content Marketing in Australia 2018: Benchmarks, Budgets, and Trends, 85% of Australian respondents agree that their organization is focused on building an audience versus 69% last year. That’s a 23% year-over-year increase, which is higher than the 18% year-over-year increase reported by North American B2B content marketers. Growing your subscriber base is an important content marketing goal. However, long-term value is created by providing your target audience with valuable content they want to receive, and building trust over time – not just gathering email addresses. While the increased focus on building audiences is great news, the data revealed additional opportunities for marketers to address for even better results. Here are some tools to help you take or grow an audience-first approach: 4 Ways to Shift Your Thinking to Truly Focus on Your Audience and How to Take an Audience-First Approach to Your Content. 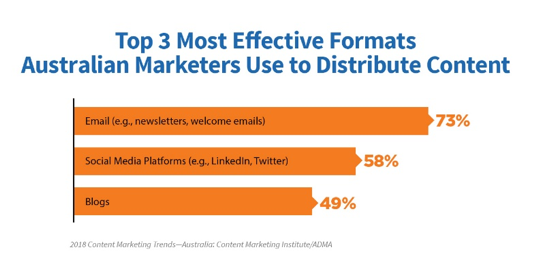 Fewer Australian marketers are delivering content consistently. Forty-eight percent of respondents always or frequently deliver content consistently (e.g., on a defined, regularly scheduled basis) compared with 60% last year – a 20% year-over-year decrease. Our take: Organizations struggle to deliver content on a regular, predictable basis for a variety of reasons. But consistency builds expectation and anticipation for the audience. If you can commit to nothing more than three blog posts a quarter, then commit to publishing one post per month. Just be sure to release it at the same time every month, (e.g., the first Wednesday) so your audience becomes conditioned to expect it. Schedule it, put it in writing, and commit to it. An editorial calendar helps. For guidance on how to set up an editorial calendar and/or get maximum value from one, check out Editorial Calendar Tools and Templates. Survey respondents say email is the format they use most often to deliver content as well as the most effective. How often should your company send emails? 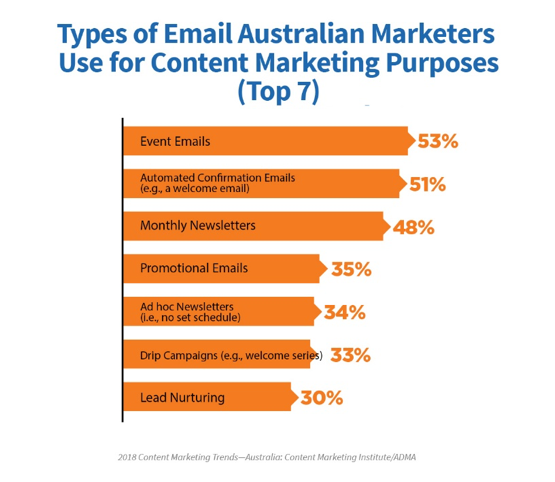 It depends on many factors unique to your situation, but 48% of respondents send a monthly newsletter, and that may be a manageable frequency for your content marketing program. To improve the effectiveness of your email program at whatever stage it is in, read How to Deliver Emails That Will Increase Reach, Impact, and Subscriber Satisfaction. Eighty-four percent of marketers say they always or frequently ensure that their content is fact-based and/or credible. That’s a high number, but 11% only do this sometimes and 5% rarely or never do. Our take: No matter how many things you do right in your content marketing, none of it matters if you aren’t checking to ensure that your content is truthful. Doing it “sometimes” will never be enough. One mistake, and your credibility is lost. Robert Rose, CMI chief strategy advisor, wrote a terrific article earlier this year on how trust and the relationship with an addressable audience will be the only value left as advertising continues to transform. Check it out here: The Democratization of Distrust Is Our Biggest Opportunity. And here’s a great resource on how to check your facts with credible sources: Fact-Checking for Content Marketers: How to Protect Credibility in the Era of Fake News [Checklist]. While covering the 2017 content marketing research findings, CMI founder Joe Pulizzi stressed the importance of being “all in” – being fully committed – with your content marketing. 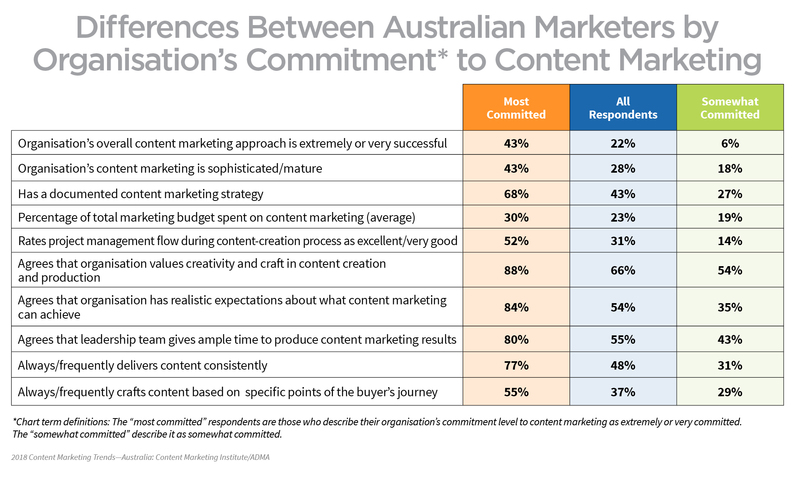 This year’s Australia report includes a chart showing how survey responses differ based on the organization’s level of commitment to content marketing. Our research has consistently shown that commitment tends to strengthen as an organization becomes more sophisticated/mature in its content marketing efforts. A stronger commitment, in general, results in greater overall content marketing success. Those who are more committed tend to spend more of their total marketing budget on content marketing, place more value on creativity and craft in content creation, and have better processes for content production. If you’re having trouble getting a full commitment for your content marketing program, check out this article: Get Buy-In from Executives with These 6 Common-Sense Reasons and How to Win the Battle for Content Marketing Buy-In. More survey respondents are focusing on building audiences this year than last, which is a great sign. To advance that content marketing success, though, the audience must come first. To see additional research findings, view the report today. Special thanks to our survey distribution partner, the Association for Data-driven Marketing and Advertising (ADMA), and our sponsor, LinkedIn Marketing Solutions. To ensure that you receive the latest research when it’s released, subscribe to the free CMI daily newsletter. Cover image by Joseph Kalinowski/Content Marketing Institute.